In the Venetian inventories PLATANIAS is mentioned as Platanea and Pirgho Platanea, there were possibly two different settlements. Originally the village was built amphitheatrically on a high, rocky place with picturesque houses. Now it has spread to the sea-side. Opposite of PLATANIAS is the island of St. Theodori or Thodorou. The Turks mention it as Tourlou-Andasi, and the Venetians as San Theodoro or San Todaro. 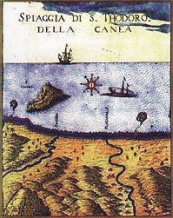 In 1574, during the Venetian dominion, it was decided to fortify it, in order to prevent the Turks from landing in PLATANIAS. So they built a multi-angled fortress on the highest point of the island and called it Turluru, and another multi-angled fortress at a lower level, which they called San Theodoro or San Francesco. There we find a three-aisled chapel of the St. Theodori, but only its foundations remain today. At the present time, the island serves as a rearing place for the Cretan mountain goat, kri-kri. In 1897, PLATANIAS was the head quarters of the general Timoleon Vassos, during the Cretan fight against the Turks. You can see on the right a photo from the 18th centurt with the island on it.